Payments experts from the European Banking Authority, Yandex, Vodafone, Orange, Dejamobile and Wirecard are among eight contributors to What’s New in Payments: Volume Two, a 76-page special report on the future of payments which is now available to download free of charge from the NFC World Knowledge Centre. This special report includes in-depth articles, thought pieces, lessons learned by early adopters, market overviews and more, all produced uniquely for this publication and in collaboration with the NFC World editorial team. Lorcan Burke, vice president of business development at Dejamobile, examines the options for banks seeking to stay visible to their customers in an increasingly mobile environment. Jörn Leogrande, Wirecard’s executive vice president of mobile services, examines the potential of the Internet of Things and artificial intelligence to transform the way we pay. Rambus presents “How digital wallets will shape the future of retail”, a white paper that explains how retailers can take advantage of mobile payments to both reduce costs and increase their margins. “The payments landscape is changing dramatically,” says Rian Boden, editor of What’s New in Payments. “Just as mobile and wearable payments are starting to become a part of consumers’ lives, the emergence of the Internet of Things is promising to take commerce to whole new environments and form factors, from the smart home to the connected car. “With these changes come new challenges and lessons to be learned for those responsible for building, delivering and ensuring widespread consumer adoption of the latest connected commerce experiences. 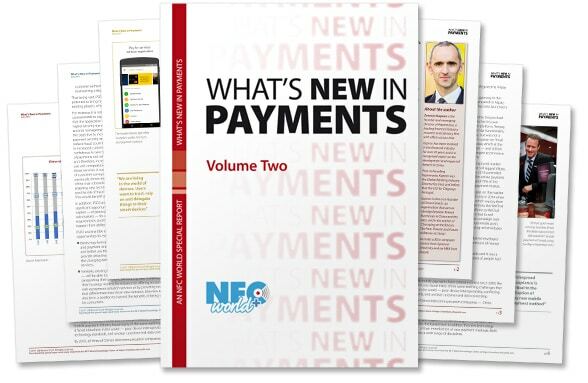 Readers can find out more about What’s New in Payments and download the report free of charge from the NFC World Knowledge Centre.